Treat Yourself to a Neater Desk (and Peace of Mind) Giveaway! Nothing beats office and classroom products that simplify, organize and show off a teacher's best self. Find out how to work better every day! Want to put your best teacher self forward in 2019? 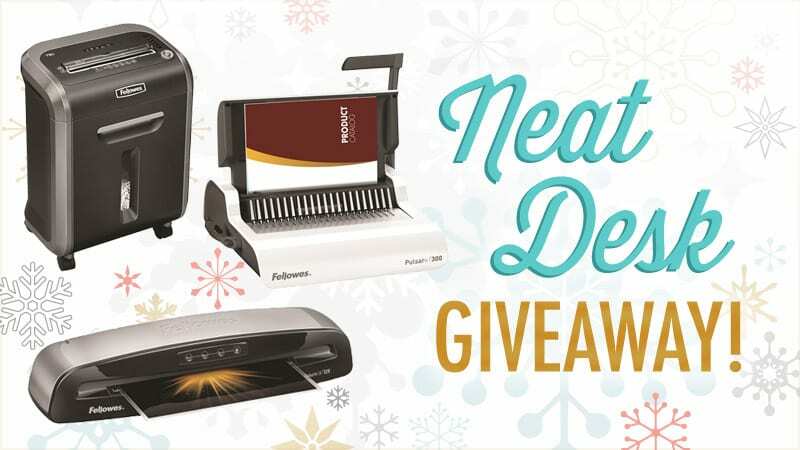 Fellowes and WeAreTeachers are giving away a Fellowes laminator, binding machine, and shredder! They’re just the tools you need to calm the chaos and protect your amazing work. Present your most awesome teacher self to your students and colleagues with these three peace-of-mind powerhouses! Enter to win today to brighten up your holidays. You’ll be classroom ready and prepped for the new year. Take your organizational and professional style up a notch. The grand prize winner will receive a Saturn3i 125 laminator, along with the Pulsar+ comb binding machine, and a 79Ci shredder. The second-prize winner will receive the shredder, and the third-prize winner will receive the binding machine. The Fellowes Saturn™3i 125 Laminator with Pouch Starter Kit will bring your laminating dreams to life! With the included laminated starter kit, you’ll be off and laminating hall passes, anchor charts, motivational posters, chore signs, calendars, and, oh yeah, holiday decorations! Your documents and perishable papers will get a major upgrade in protection for a beautiful, longer lifespan. The Fellowes Powershred® 79Ci 100% Jam Proof Cross-Cut Shredder is a handy tool for disposing confidential paperwork from parents and administrators. You’ll definitely have peace of mind knowing you have a tool that keeps vital information safe. Its jam-proof technology keeps the process frustration free. And for safety, its SafeSense technology stops shredding when hands touch the paper entry. The Fellowes Pulsar™+ 300 Comb Binding Machine w/ Starter Kit is perfect for the teacher who needs a small-space binding machine that packs a top-quality punch. It punches up to 20 sheets at once, and it will bind 300 sheets at a time. Your presentations, workbooks, and guides will thank you. Bind to impress! No purchase necessary. Making a purchase will not increase your chances of winning. The promotion is open only to legal residents of the United States who at the time of entry are a) eighteen (18) years of age or older and b) currently employed full- or part-time as an educator by an accredited public or private K-12 school in the United States. WeAreTeachers is the official administrator of this program and Fellowes is the Sponsor. Employees of WeAreTeachers or the Sponsor and their affiliated companies, subsidiaries, distributors, sales representatives, agents, advertising and promotional agencies, and the immediate families and household members (parent, spouse, child or sibling) of each are not eligible to participate. The Promotion is subject to all applicable federal, state, and local laws and regulations. Winners will be selected by random drawing and announced on the WeAreTeachers website by January 5, 2019.